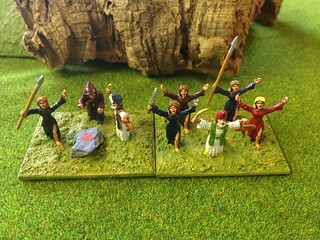 Airfix never had druids and screaming women! 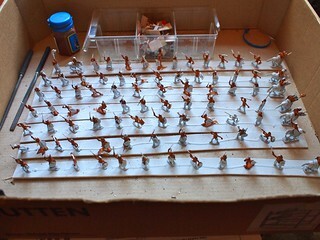 Moving house twice in a year focussed my attention on just how many unpainted little metal men I had. Yes, I used the past tense there! I decided to clear out anything I just have a few of and wasn’t going to turn into a complete army. 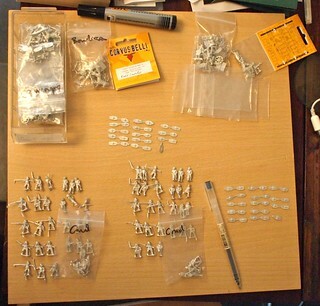 I also decided that for big ancients armies I would move to 15mm size figures. This is because they take up less room, are quicker to paint (as I can’t see so much detail now!) and thanks to scale creep are almost as big as my old Airfix figures were! 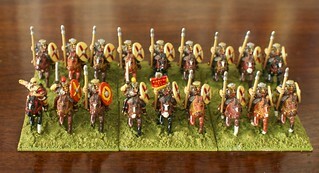 Before making this decision I considered trying 10mm for ancient and medieval but found them not quite right for me. I used some Pendraken 10mm Vikings as a test and can while they did not suit me I suggest trying Pendraken if you are considering 10mm. I sold these on eBay as part of the grand clear out in the end. 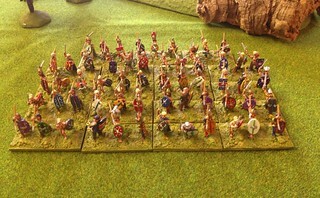 Another consideration was having a Peter Pig Roman army in 15mm I had painted for DBA and DBM. Getting a similar scaled opponent made sense of course but like most wargamers I try to leave sense out of it when choosing armies and scales! The challenge with painting an army of irregulars is getting the variety there without painting each figure separately. I have a simple system for this involving strips of cardboard! This is a rather ocd variant of the old take a colour and paint a different bit of each figure with it. To ensure variation I sort the figures into groups with a minimum of duplicates. Then each group is glued to a cardboard strip and undercoated. I paint all flesh first using a red brown wash then a warm flesh colour. After that the fun begins! Well my idea of painting fun anyway. Take a colour and go through a strip of figures applying it to different areas, so a dark brown is hair on figure one, trousers on figure two, belt on figure three and so on. Then take another colour and move onto the next strip. As you can now see repetition of colour and pose is kept to a minimum. Having plenty of paints helps! One point to keep an eye on is use brighter, historically more expensive, colours on better equipped wealthier types. Use patterns on clothing and showy shield decorations as well, again more so for those who could afford them. For the sake of sanity and speed use one colour for shield backs, spear and weapon shafts, metals. Then varnish and base to taste!